According to Diabetes UK, more than one in 16 people in the UK has diagnosed or undiagnosed diabetes. According to Diabetes UK, more than one in 16 people in the UK has diagnosed or undiagnosed diabetes. Of these, 10% have type 1 and 90% type 2. Diabetes UK’s analysis of recent figures shows that the number of people living with diabetes in the UK is now more than 3.3 million, an increase of almost 60% (or 1.2 million adults) over the decade to 2013/14. This does not take into account the 590,000 people who are estimated to have undiagnosed diabetes. A report from the Health and Social Care Information Centre found that diabetes medication now accounts for almost 10% of the NHS drugs bill in England, up from 6.6% a decade ago. The main symptoms include passing urine more often than usual, especially at night; increased thirst; extreme tiredness; unexplained weight loss; slow healing of cuts and wounds; blurred vision; and genital itching or regular episodes of thrush. In type 1 diabetes, the signs are usually obvious and develop quickly, while in type 2 they may not be so apparent. The likelihood of developing diabetes depends on a combination of genes, lifestyle and environment, says Diabetes UK. 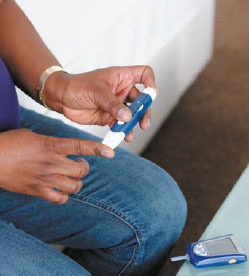 People with a family history of diabetes are two to six times more likely to develop it, and it is slightly more prevalent in men than women. Type 2 diabetes is six times more common in people of south Asian descent and three times more common among people of African and African-Caribbean origin. Obesity accounts for 80-85% of the overall risk for type 2. Conditions that increase the risk include cardiovascular disease, hypertension, stroke, polycystic ovary syndrome, previous gestational diabetes and mental health problems. The National Institute for Health and Care Excellence advises that healthcare professionals should encourage some patient groups to undergo risk assessment for type 2 diabetes. These include adults aged 40 and over, people aged 25 to 39 who are from some black and minority ethnic groups, and adults with conditions that increase the risk of diabetes. Discuss the importance of early diagnosis with patients to help reduce the risk of long-term complications, including retinopathy, nephropathy and neuropathy. ‘I am not surprised that the number of people with diabetes is increasing, but that it’s rising so quickly. We know the NHS is struggling to cope and one of the major stressors is diabetes. ‘The NHS drugs bill is not the whole picture. The biggest cost is long-term complications; if we don’t treat early, then these will be higher.